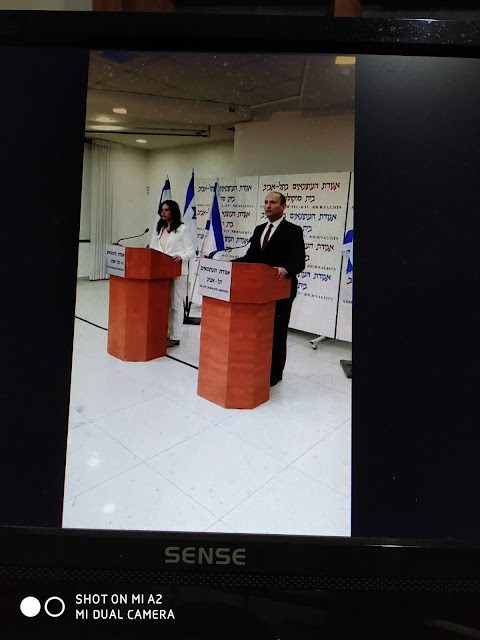 It's less than twenty-four 24 hours since Naftali Bennett and Ayelet Shaked shook things up by announcing that they're breaking from the NRP-Jewish Home Party and establishing the New Right. No surprise that many people claim that they are making a mistake. if we hadn't been invaded and destroyed in the 1967 Six Days War. Most probably, there never would have been a State of Israel, since on paper we had so little going for us when we declared Independence on May, 14, 1948. A "normal" people would have been so beaten, both physically in terms of numbers and emotionally, that any remaining Jews would have taken the express train to complete and utter assimilation after the Holocaust. Or most probably, like our ancient contemporaries/enemies, we'd be no more than a footnote in history. Israeli politics is more than plain numbers. There must be balance in the ideological spectrum, and our political spectrum has been over-heavy on the Left for a long time. There are quite a number of Far Left parties, both Arab and Jewish, but there hasn't been a strong unabashed Right Pro-Jewish Rights in the Land of Israel for much too long. That's why political positions that had once been only heard from the Far Left are now heard in the Center and what I'll call the "Lite Right." Although the media loves to call Likud an ideologically Right party, the truth is that it's Center-Right. As is the NRP establishment which controls certain aspects of the Jewish Home Party. It kept reigning in Bennett and Shaked to the Center, which is what the NRP is all about. For the NRP, it has always been a claim to fame that they could mould themselves to suit any coalition, Right, Left or Center. To be perfectly honest, he has his own unique views, which change periodically according to what he thinks will give him more electoral support. Or to follow my "Tug of War" analogy, his rope isn't attached to the one everyone else is tugging. He's just faking it. I don't pretend to be a fortune teller, and I don't have any recent direct contact with Naftali Bennett or Ayelet Shaked. So, I certainly can't guarantee that the New Right will be what they are saying it will be. One thing I do know is that Prime Minister Netanyahu firmly believes that to be Prime Minister, he must keep to what he considers the political center. I heard him say so in person. Gd willing, Bennett and Shaked don't hold that opinion. Just Wondering, How Accurate are The Polls? 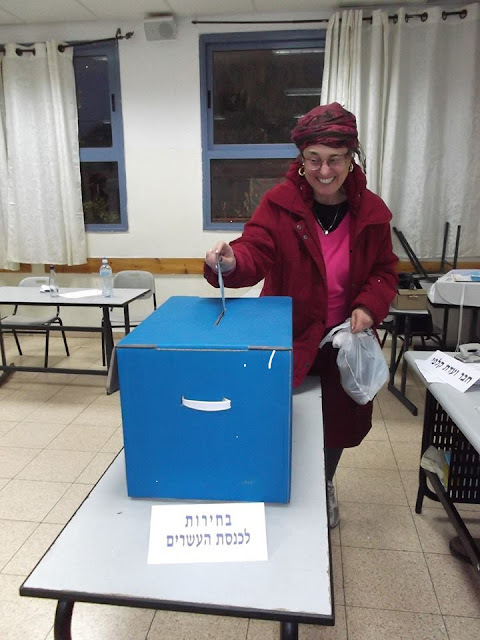 Do the election polls really show what the 2019 results will be in Israeli Knesset Elections? Who appointed the committee members? With all this uncertainty, it's really hard to know today what will be in three and a half months' time. For the latest political election polls, I check on Jeremy's Knesset Insider. He keeps track, and in each post he also shows the right/left balance. Of course, this is just the "potential" and lots of guesswork, since there are political parties which shift right/left according to which way they think will bring them votes during election time and power in coalition negotiations. Just to remind you that in Israel we vote for Knesset seats only. We do not vote for Prime Minister. Also, no political party gets a majority of the 120 seats, so that a potential prime minister must be a tremendously skilled and talented wheeler-dealer aka negotiator. This is the reality of Israeli government, political system. Will Bibi's "center" policies win him another term as Prime Minister of the State of Israel? 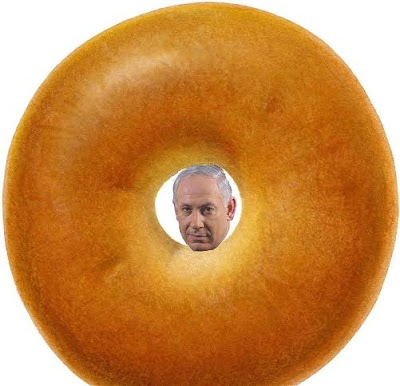 Bibi has called for elections. This year 5779 and soon 2019, Passover cleaning will also mean cleaning up all the campaign litter. Yes, the date chosen is April 9, which is the 4th of Nissan, just a week and a half before the Passover Holiday. Yes, here in Israel we function on two calendars simultaneously. And if you're curious, I haven't a clue as to which political party to support. I don't know if I've ever voted for the Likud. The first time we voted, in 1974, there wasn't a Likud Party. There was Gahal, which was the Herut and Liberal parties. Herut, Freedom was headed by Menachem Begin. In those days, Begin was our political and ideological hero. And the Liberal Party was the non-socialist one. They were the two parties on the Right, while the Labor Party was on the Left, and the 1st of May was still celebrated by them. 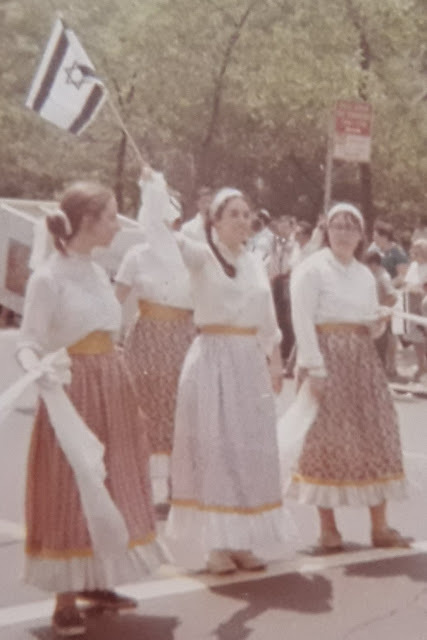 We missed the 1977 elections, since we were on shlichut, doing Zionist youth work in London. Shlichim don't get absentee ballots, though embassy staff do. When we returned home to Jerusalem, miraculously, Menachem Begin was Prime Minister. For the first time in Israeli history a non-Labor/socialist was in charge. But then Begin did what Labor never dared to do, something that Begin if in opposition would have condemned, he made a treaty Peace Agreement with Egypt's President Sadat, gave Egypt the Sinai and destroyed a slew of Jewish communities. After that I supported Geula Cohen's Techiya Party. I voted for them until they faded from the political scene, when they didn't get enough votes to make it into the Knesset. Since then I feel like a political orphan. Over the next three and a half months, until Knesset Elections, I'll be in political pundit mode. Gd willing expect more posts. I warn you that I have more questions than answers. Let's talk. That's what my comments are for. Also please feel free to share this post and the subsequent ones. 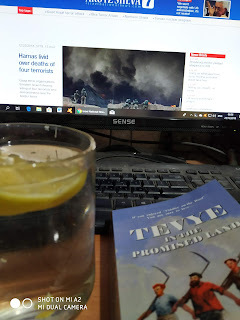 Last night I finally finished the first volume of Tzvi Fishman's Tevye trilogy, Tevye in The Promised Land, and I loved it! I have the following two volumes waiting for me to read, but I'm taking off time in between each one to write reviews. Fishman's jam-packed historical novel is superb. 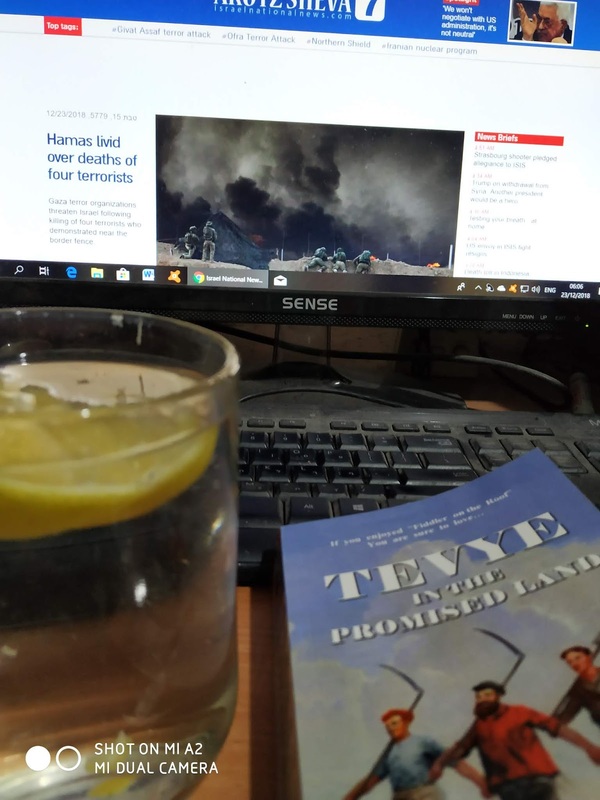 Tevye in The Promised Land is an extremely well-written example of a very difficult literary genre. He manages to create both believable characters and place them in accurate and factual historical context. Tevye in The Promised Land is full of surprises and actual historical figures. And if you were wondering, Fishman's Tevye is based on the character invented by the famous Yiddish author Shalom Aleichem, which can be seen on stage and screen. Especially since I had read and reviewed Rebels in the Holy Land, which is about the early history of Mazkeret Batya, I can really believe that so many things could happen to one family and the awful things about Baron de Rothschild's administrators. The early Zionist pioneers, even the least religiously observant, were true tzaddikim, holy Jews. They had to put up with and overcome difficulties that dwarf everything that modern olim, immigrants to Israel must deal with. And in modern olim, I include people like myself who made aliyah almost a half a century ago. The early Zionist pioneers had to cope with and conquer difficulties that rival the greatest fictional adventure stories. First of all, traveling in those days was extremely dangerous and difficult. Today you can safely and routinely fly to Israel from places in less than a day. Over a hundred years ago, lovers of Zion had to trek by foot, horse-drawn carts, unreliable boats and more. The trip could take months or longer. When the immigrant arrived, he/she wasn't always allowed in to the Holyland. Whether the ruling occupier was a Turk or British, they had the same agenda, STOP JEWS FROM ENTERING. Their sympathy was with the Arabs, who had no national aspirations, which was what the occupying powers liked. Even when Jews, like Tevye and his family, managed to get permits to enter the Promised Land, that didn't promise them an easy time. Besides the utter poverty, there were illnesses, locusts, Arab terrorism, impossible regulations by the Baron's staff, land unfit for agriculture, continued antagonism from the occupiers, tension/competition between the religious and secular Jews and even more challenges. Fishman has Tevye and his family encounter and cope with them all. They also get to know and work with some of the greatest real life historical giants of the times, such as Rabbi Kook, Zeev Jabotinsky, Yosef Trumpeldor among others. Before Tzvi Fishman's aliyah, move to Israel, he was a Hollywood screenwriter. And I must say that his Tevya saga is just perfect, not for a two hour movie, but for a long-running television series. I highly recommend Tevye in The Promised Land. It's a book that can be enjoyed by people of all ages. Children will love it, too. If they are too young to read it themselves, it's the perfect book to read to your children or students. As you read it, you can supplement it with history of the time, if clarification is necessary. I've already started on volume 2 and the third is waiting for me. 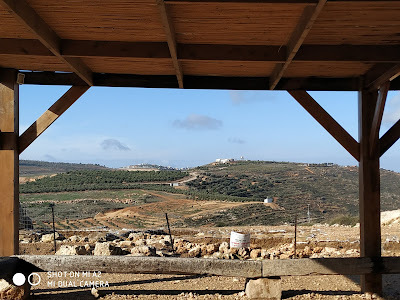 Yesterday, again, I needed to catch a bus to Ariel from the "shfeilah," west of Shiloh, after a festive luncheon with friends in Pardes Chana. This time I was dropped off at the Oranit/Elkana bus stop, which I hoped would give me a better chance to get on a bus than at the Yarkon Junction. In the afternoon, buses to Ariel are full of Arab workers who get off before Ariel. The buses are so full that most don't even stop unless someone needs to get off. At the Oranit/Elkana bus stop, generally a few people get off, so there's a better chance to get on the bus, and in addition there are a few more lines going to Ariel. After close to ten minutes of waiting a bus came that did let passengers off from the back, but the driver didn't open the door. BTW, I was waiting with a bunch of Arab men for a bus to Ariel, no other women or Jews. A few Arabs went/snuck in by the back door, something I wrote about a few weeks ago. I got closer to the front door and tried to get the attention of the driver and succeeded. The bus driver opened the door and signaled to the men waiting that only I was to board the bus. Happily I did, even though all I could see on the bus were Arab men. The driver also asked the man sitting in the first seat to get up so I could sit. Yes, not for the first time, I sat next to an Arab on a bus. My view from the front seat of the bus to Ariel. Our road was clear, while most vehicles were traveling towards Yarkon Junction and beyond. The bus was packed, with people standing in the aisle until we got to the Revava Junction. 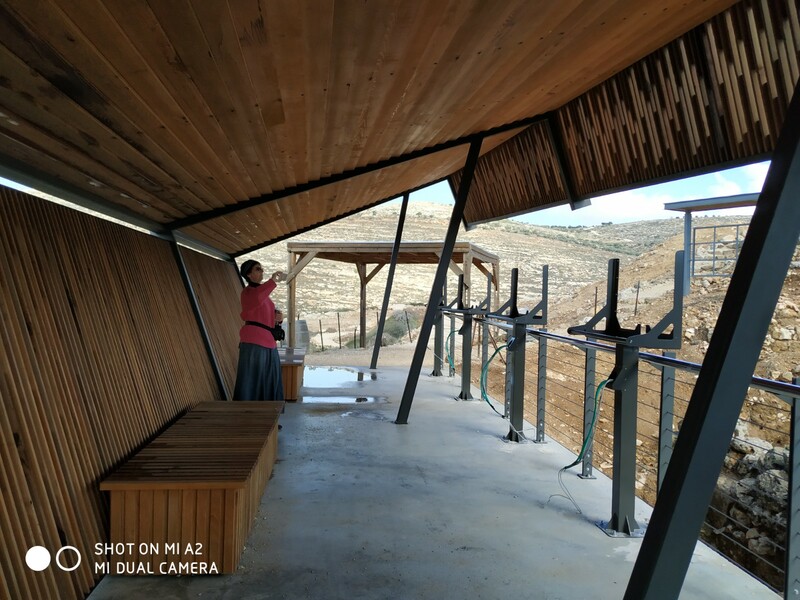 That's the last stop on the Trans-Samaria Highway before turning into Ariel. And that's where all of the remaining Arabs got off. Look to the right of the picture below, and you will see dozens of cars, Arab cars. Sometimes I've seen a market setup there, too. There was lots of noise coming from it, which we could hear on the bus. That's where the Arab workers leave their cars or get rides home to their villages. Also some Jewish passengers get off there at the Revava Junction and cross the street to go to communities in the northern Shomron, Samaria. When we pulled out of that bus stop, the bus was almost totally empty. A few minutes later we entered Ariel, and I got off at the Ariel University. 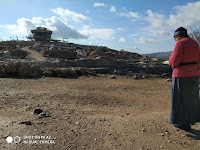 I walked to the trempiada, hitchhiking post there and miraculously got a ride to Shiloh within a couple of minutes. My neighbor took me straight to my door. Gd is great! It could be. Maybe it's a glass mosaic aka stained glass? There's something haunting about it, like a Vincent Van Gogh painting when his demons were overpowering him. Well, the truth is that the "technique" is related to "demons," but not the imaginary kind, not the kind of a schizophrenic, chemically imbalanced mind. 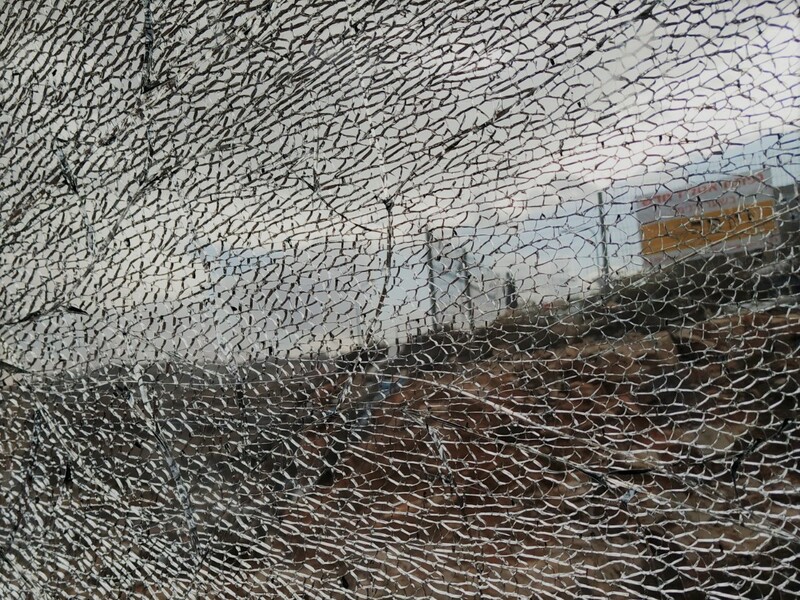 Yesterday, when I got on the bus home from Sha'ar Binyamin burdened with heavy shopping bags, the closest unoccupied seat was by a cracked window. 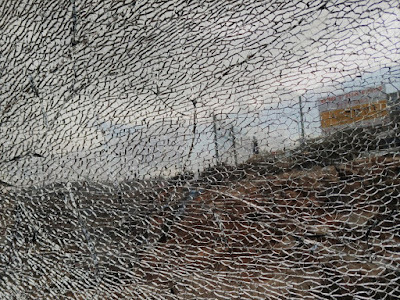 I try not to sit by cracked windows. 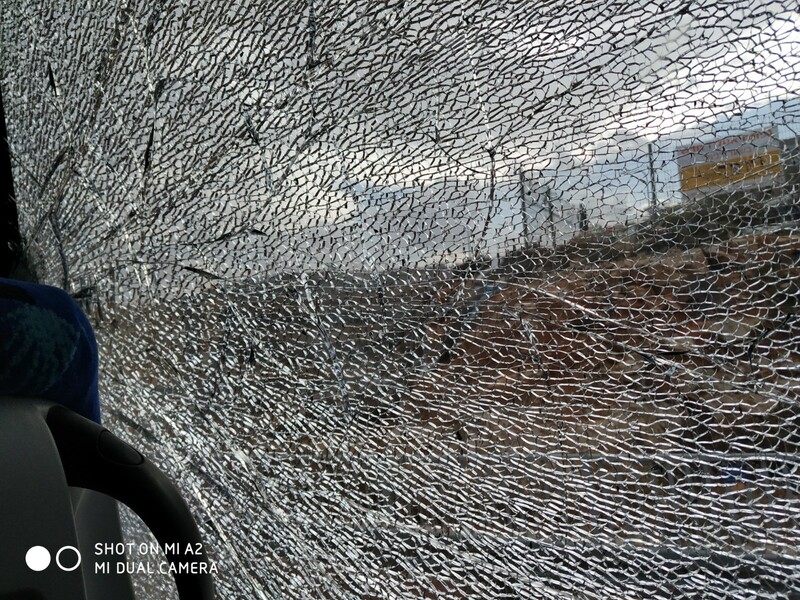 The buses that ply our routes have bulletproof windows. They are also strong enough to stay whole/unbroken if a rock is thrown at it. To be accurate, that's true until you see cracks like this one had. The recent increase in Arab terror attacks, davka, on the road we travel, has killed, injured and caused damage. 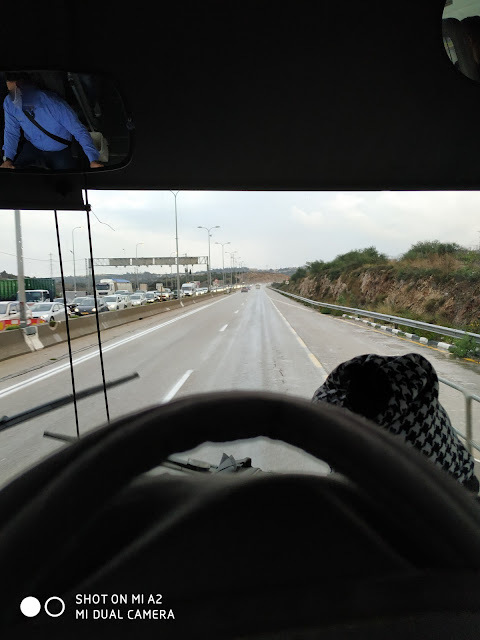 Thank Gd yesterday's trip to and from Jerusalem was uneventful, but we can never take an easy and safe trip for granted. Decades ago, when a horrendous fatal car accident halved a local family, the injured survivors were cared for in the same hospital room, where they sat shiva together. Many times since, I've seen pictures of hospitalized family members, of both sexes and various ages, in the same hospital room. It's a very humane and comforting policy, which doesn't exist in other countries. 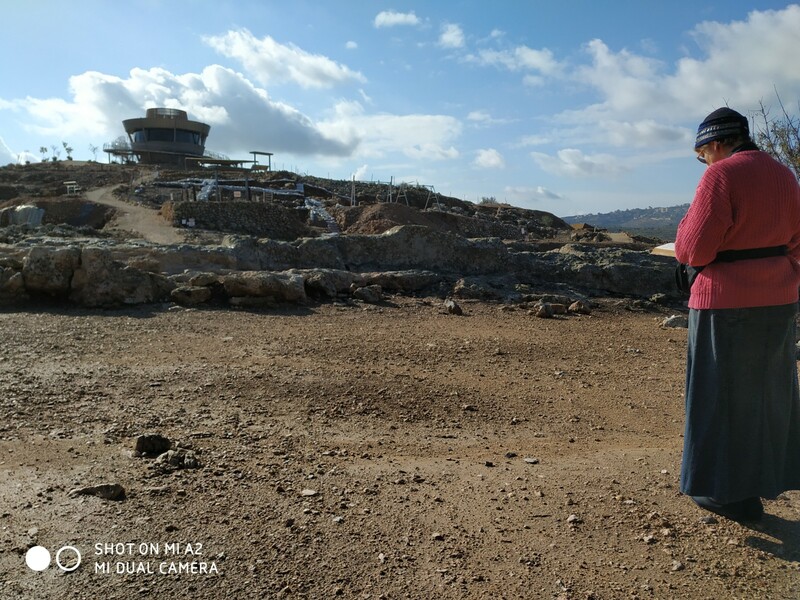 The young couple, Shira and Amichai Ish-Ran, who as a result of an Arab terror attack outside of Ofra, not only were injured, but as a result of Shira's injury, their baby didn't survive. They are now together in Shaare Tzedek Hospital in the same room. Obviously, after such physical, medical and emotional trauma, they have a lot to deal with. Separation would have only made it worse. 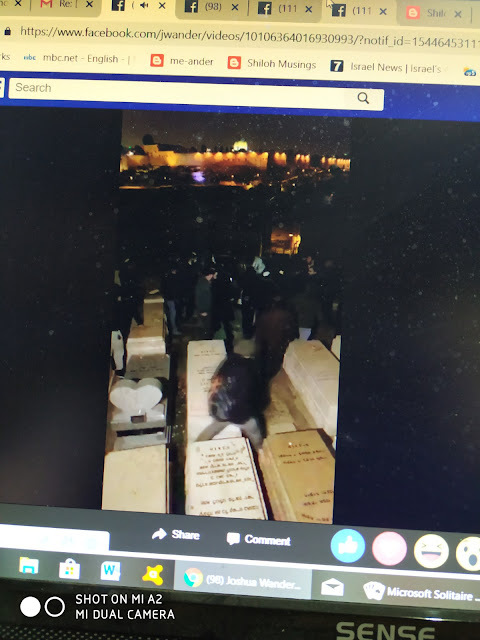 According to Jewish Law, there's no mourning, shiva-all the usual restrictions, after the death of a tiny baby under a month old, so friends came to sing to them. Do you see this in other countries? Only in Israel. 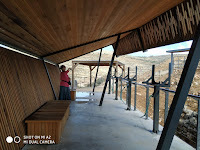 Way back when, in the early days, first couple of decades of living in Shiloh and the development of Mateh Binyamin, the Benjamin Regional Council, all of the yishuvim, communities off of what is now Kvish, Highway 60 and those on the parallel section of the Alon Road, considered ourselves as suburbs of Jerusalem. The first fifteen years or so we lived in Shiloh, there wasn't a Kvish, Highway 60. 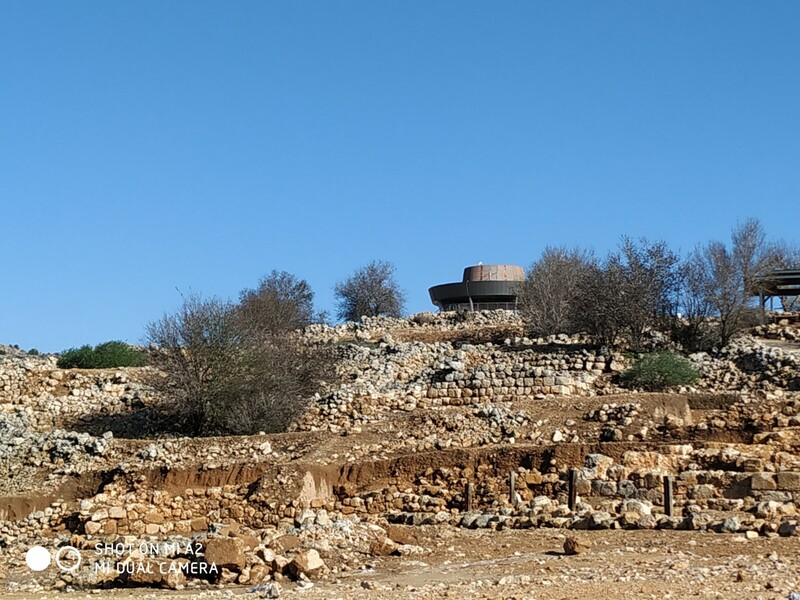 We traveled via the eastern neighborhoods of Jerusalem and Ramalla, passing Beit El's western side, then the Jalazoun refugee camp and Waadi Charamiya to get to Shiloh. 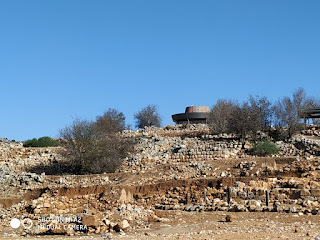 Then there was no Adam Junction connecting Adam, Jerusalem, Ramalla and the Shomron-Binyamin. 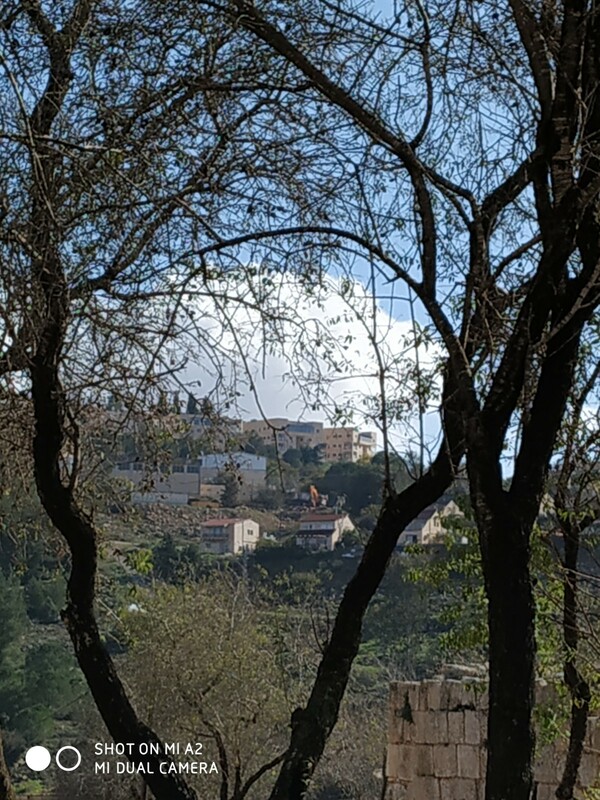 Even though we had to drive through Ramalla and those Arab neighborhoods, the trip, even by bus, was about an hour from Shiloh. With time and even after the bypass roads, Jerusalem seemed to get much further away. 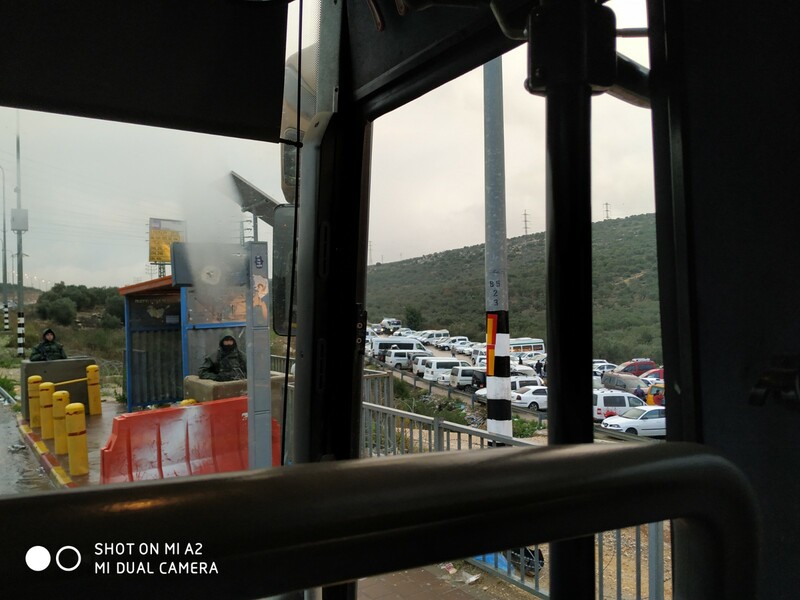 The past few years has become a nightmare for those who need to travel to and from Jerusalem. Traffic jams began as early as 6am. For the past few years, I've been telling people that Shiloh has moved to the Petach Tikvah area, since it's so much easier to get to Rosh Ha'ayin, the Yarkon Junction, Petach Tikva and Hod Hasharon. Many of my neighbors, who have cars, take care of all sorts of official things in the nearby city of Ariel. Lots of people tell me that they can't remember the last time they've gone to Jerusalem. I sleep in Jerusalem the night before my Matan classes. This way I can see friends and family, plus get to class easily in the morning. There's a whatsapp group I'm in for reporting traffic jams; as of right now it has 257 members. Until close to a week ago, there were constant updates about traffic jams. 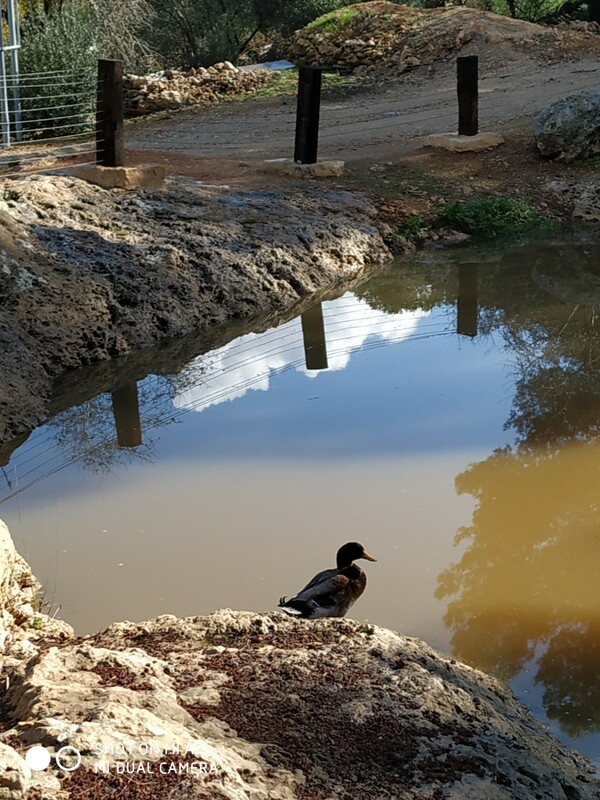 In recent days it has quieted down, except for the traffic stopping as a result of terror attacks and car accidents, which is another topic completely. Why has traffic speeded up? Why has Jerusalem moved closer? There's now a tunnel/underpass at the Adam Junction. Vehicles needing neither Adam nor Ramalla now drive directly, unhindered. Rush hour is now fast rather than slow, B"H, thank Gd. Take a look! I'm a rare breed. 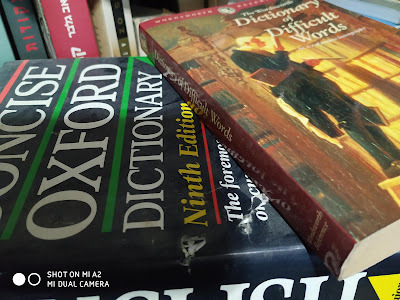 I love grammar, and I have a very sensitive ear to the nuances of language. I've written many times about how important it is to word bombing, shellings, rocket attacks, etc in "active" rather than "passive." Also, please don't word things giving the impression that a gun spontaneously aimed itself and shot someone. an individual occurrence or event. a distinct piece of action, or an episode, as in a story or play. I also go rather ballistic when I read about people/Jews "who perished" in the Holocaust, as if it was a natural disaster, like an avalanche. By using "parve" gentle words and inaccurate grammatical forms one is actually distorting the truth. It is not an "incident, something that occurs casually" when Arab terrorists shoot at innocent Jews standing at a junction. Photo of the "live" via facebook funeral of prematurely born Amiad Yisrael Ish-Ran. Accurate reporting and writing is extremely crucial in Israel's war for survival against the cruelest of enemies, Arab terrorists and their supporters. Don't be shy about writing clearly and bluntly. Many people here in Israel and the Jewish World know exactly what I mean. A tiny baby died today. The tiny baby was one of the youngest victims of Arab terrorism. The tiny baby was even younger than Yehuda Shoham, HaY"aD, a neighbor of mine, who at the age of five months died as the result of a terror attack less than twenty years ago. There have been so many Arab terror attacks against innocent Jews that it's hard to remember them all, and it's hard to remember all of the victims. But for the past few days many of us have been praying for this tiny baby, whether we know the family or not. Actually, many of us have discovered that we do know the family. And even if we don't have a personal connection, how could anyone remain disengaged from the story of a young beautiful couple who had been among a handful of people trying to get a ride outside of Ofra and were shot and injured by Arab terrorists? The most seriously injured was a young woman, married barely a year ago. She was pregnant with their first child. And now the baby is dead, and the young mother has to recover from life-threatening injuries. Our thoughts, love and sympathy are with Amichai and Shira Ish-Ran, their family and close friends. 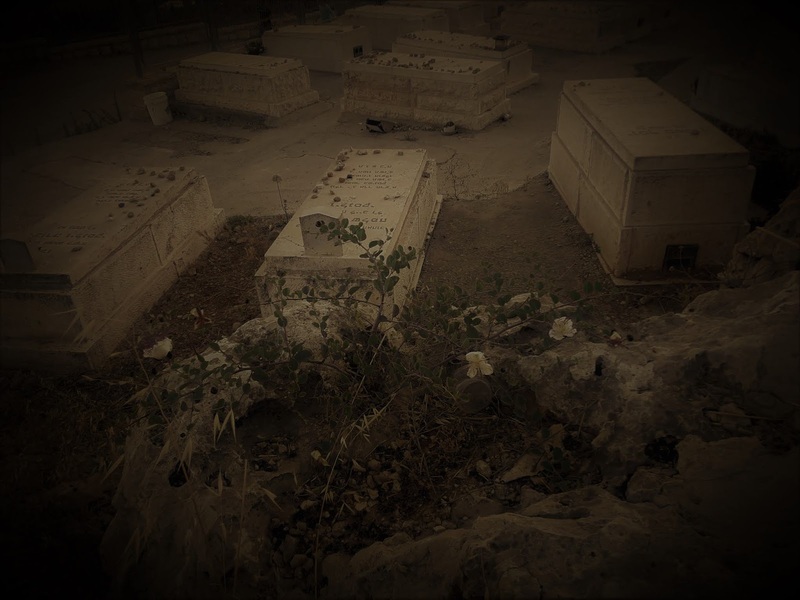 The cemetery was started when Rachella Druk, HaYa"D, was murdered by Arab terrorists over twenty five years ago. As Chanukah neared an end Arab terrorists attacked a roadside trempiada, hitchhiking post outside of Ofra in the most cowardly of ways. They shot at the innocent people waiting for rides. It's a place I sometimes find myself at, because people going to and towards Shiloh pass by. My practice is to check the bus app efobus to see when a bus to Shiloh should be arriving. And if there isn't a bus within a reasonable amount of time, I wait outside on the sidewalk, behind the barriers. The barriers can prevent a regular car from hitting people, but it won't stop bullets. Over half a dozen people were injured including a young pregnant woman. Her baby was delivered prematurely as soon as she got to the hospital. They all need our prayers. No "peace plan" will stop terror, only physically eradicating the terrorists and their financial backing will be good first steps. It will take generations to change their belief in terror and hatred of Jews and Israelis. It's winter here in the HolyLand, and if we don't get lots of rain in the winter, that's bad news. So, when we had three days of rain, I was happy. Our sages tell us that weekend/Shabbat rains are the greatest gifts from Gd. It's a time we're not supposed to travel. We are lucky to live near the synagogue, so there's no inconvenience. As long as electricity works, and the heat is on, I'm not going to be tempted to complain. This morning, when the sun showed its golden strength, not hidden by clouds and rain, everything was sparkling and clean. Leaves looked like emeralds, decorated by rubies, diamonds and other gems. The blue silk sky was exquisite as I walked down to Shiloh Hakeduma, Tel Shiloh for our Women's Rosh Chodesh Prayers. Yes, Gd planned the dry sunny weather to coincide with our Rosh Chodesh Tevet prayers. 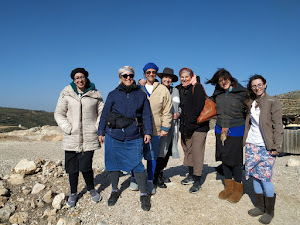 Next month is Shevat, and the Rosh Chodesh Women's Prayers at Shiloh Hakeduma, Tel Shiloh, site of the Mishkan, Holy Tabernacle will be on the 1st of Shevat, 5779, Monday 7-01-2019, 8:30am. We sing Hallel out loud, but the rest of the prayers are said silently and as individuals. There will be a tour of the Tel and Divrei Torah, Gd willing, in both Hebrew and English. If you'd like more information, please contact me shilohmuse@gmail.com with "Rosh Chodesh Prayers" as subject. Shiloh Hakeduma, Ancient Shiloh is open six days a week. It's a recognized tourist and archaeological site. Contact them directly at visit@telshilo.org.il, 02-5789111. Gd willing this winter will continue with frequent rainy periods, like we're having now. It should be for a blessing. And we must remember that a drought is a curse/punishment. 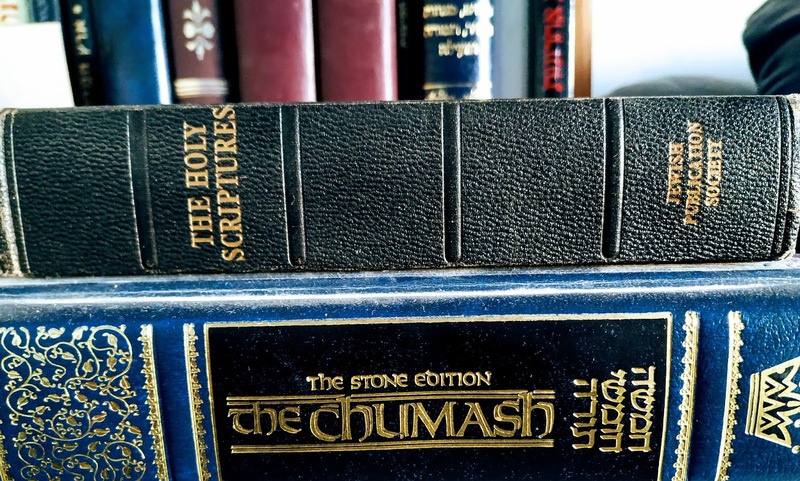 We Jews are "the People of The Book," and that has two lessons for us. One is that every word and word choice has power. It is possible to destroy a person with the wrong word, even if only intended as a "joke" or to "tease." Also, "The Book" is our Tanach, Bible, the Jewish one, and it has never been revised, added to, by Gd. There is No "New sic Testament." 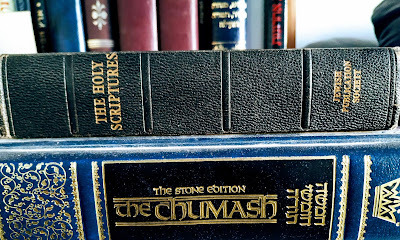 The meaning behind that term, especially as it's used in conjunction with the "Old sic Testament," sic, is that Christianity is the Gd sanctioned revision of Judaism, which no good Jew accepts. Judaism is the only religion of the True Gd. The basis of Judaism in in the Tanach, Bible. And the basis of Judaism is that we have only One Gd and are forbidden to worship a human. There is a Christian bible, and there is the Tanach, Bible. I'm not shy about pointing it out, even when the speaker is a renown Jewish lecturer/expert. 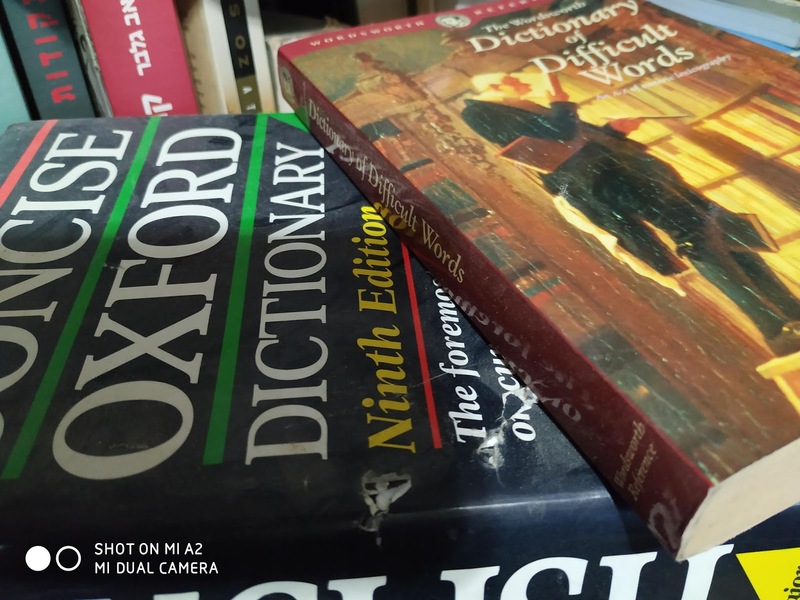 We must be very careful in the terminology we use, because words have multiple meanings. Just because a term is the "accepted" one by the general public, does not make it Kosher. Chanukah is the Jewish Holiday during which we celebrate our victory over the Ancient Greeks and Hellenists, the assimilated Jews of the time. It's the perfect time to inspect our language and rid it of foreign anti-Jewish terms. What Really is The Light of Chanukah? One of the big misconceptions about the lights on the chanukiya, Chanukah Menorah is that they are to compensate for the shortness of winter days. 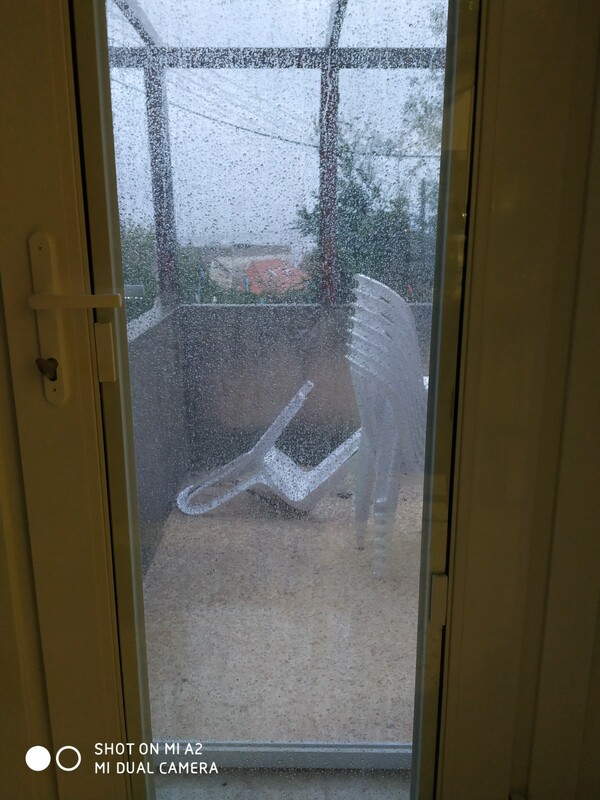 True, the Chanuka holiday occurs when daylight is shortest, and here in the Holy-Land it may rain, though very rarely snow. But we are forbidden to use the light for anything practical. It is not supposed to be the light for the room, or the street, or for reading, cooking or anything else one needs light. The light of the chanukiya, Chanukah Menorah is to publicize the miracles that Gd performs for us, even more often than we may notice. Yes, specifically, on Chanukah, we celebrate the fact that time and time again, Gd is on our side. When the odds and the experts say that we're about to be defeated, such as when the powerful Ancient Greeks invaded our Holy land and forbade us to observe Judaism, we defeated them and returned Jewish worship to the Holy Temple. Over the millennia, this has happened time and time, again. Also, please remember that the Modern Greeks aren't ruling and occupying the Holy Land any more. None of our ancient enemies exist today. They may have won many battles, but we, with the help of Gd, the One True Gd, have won the war. That is what the lights of the chanukiya, Chanukah Menorah shine and broadcast to the world. Where do You Light Your Chanukiya, Chanuka Menorah? The light of our Chanukiya, Chanuka Menorah, is supposed to be a sign to the world that we, the small Jewish People, cannot be defeated by big, strong armies. 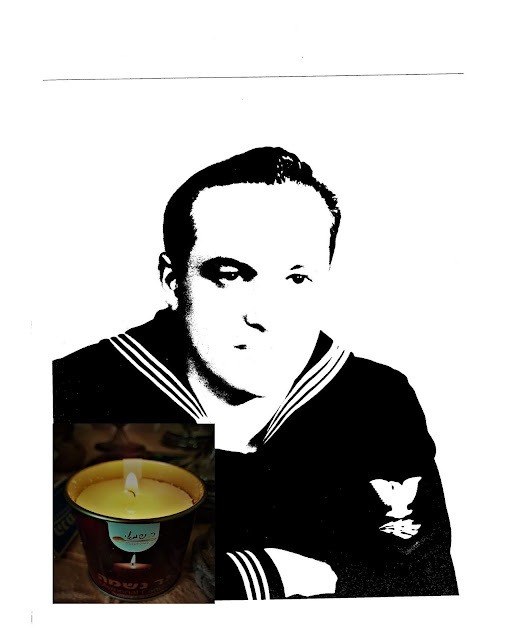 It's not supposed to be a light that physically illuminates. The Light of the Chanukiya, Chanuka Menorah is not to be used for any practical purpose, like reading or navigating and certainly not to light up a room. We've always set up our chanukiyot on window sills facing the main street. 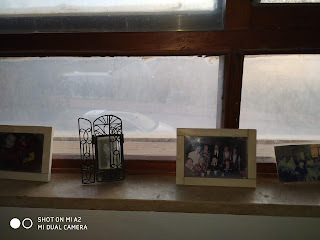 Since our custom has always been that everyone old enough to have some understanding of the mitzvah should light their very own chanukiya, there have been years when both our meter plus window sills were full of chanukiyot. Nowadays, there are rarely more than just the two of us rattling around this empty nest. Our big family Chanuka celebrations are generally at the kids. Many of our neighbors light their chanukiyot outside, by their doors or right on the sidewalk. The mitzvah of פרסום הנס pirsum haness, publicizing the miracle, is taken very seriously. What are your family and community chanukiya-lighting customs?